In the year since we launched Meribook, we have been working hard to add new features and functionality to increase productivity and help users easily share their knowledge from the best note taking software. Considering the interface was quite simple with the book, chapter and section concept the initial design we had was quite simple and basic, but today I am excited to release our latest version (4.5.0) - one that focuses on design. As you know, Meribook's main motto has been to 'enter the information' FAST, and to retrieve the information FASTER. Any content can only be 3 levels down Book > Chapter > Section that's it. Now, over the past year we have focused heavily on features related to 'sharing' your content. You have very fine grained control of what you can share and how you share. 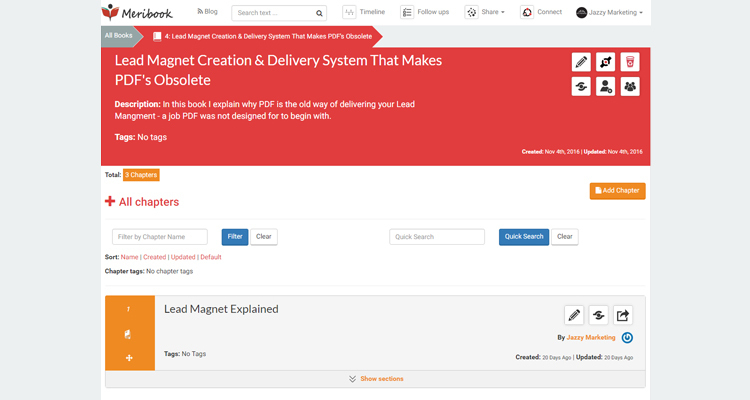 Meribook Connect - our marketing feature to deliver your lead magnet, where users can subscribe and access your book with ease. Share links - you can share just a section or a chapter or parts of chapters or the whole book. All this with with just a couple of clicks to enable / disable access. Invites - add email to have users sign up and get access to your book or chapter or section. These multiple ways to 'share' your content with that much fine grained control meant the interface was getting harder to understand. So, today with our latest release we focused on a redesigned interface. I believe we are one step closer to bringing back the clarity and simplicity we started off with. We are just getting started, this new release focuses on the main pages. In the coming month you can expect to see the new interface design on additional pages. We're excited that Meribook has become more feature rich over the past year, and now it's also gotten a lot cleaner and simpler. So, please do tell us what you think so we can make the best note taking software even better. ALAUDDIN AHMED WROTE this on Nov 24 There are 0 COMMENTS.